What do they have in common? Star power, efficient offense, pretty solid defense, good coaching…check, check, check and check. But how about an aggressive front office? Each of these four teams made a major trade in the last two years. This was a sign-and-trade, not a straight free agent signing, but the Magic only had to give up a conditional second round pick. The upside for the then-Seattle Supersonics was a trade exception worth $9 million. The contract (six years, $110 million) seemed outlandish at the time, and Lewis is still overpaid, but the Magic did what they had to do to get him. He’s a great fit for what Orlando is trying to do. They are built like the Rockets were in the Hakeem Olajuwon era — find a big man who commands a double-team, and surround him with great shooters. Lewis is the Magic’s version of Robert Horry in that he’s a lanky, versatile, sharpshooting big man. Strength-wise, he’s not built like a typical power forward, but since the NBA has gotten smaller and quicker over the past few years, he can get by against most teams. Offensively, he creates all sorts of problems for opposing power forwards as he can drill the long ball (career 39% from 3PT) or take it to the rack. He’s also pretty good in the post when teams try to defend him with a smaller player. Sure, the Magic overpaid on that contract, but I think it’s safe to say that if they hadn’t, they wouldn’t be in the Eastern Conference Finals right now. Lewis is a big, big part of Orlando’s recent success. GM Otis Smith deserves a lot of credit for having the cojones to pull the trigger on this deal. 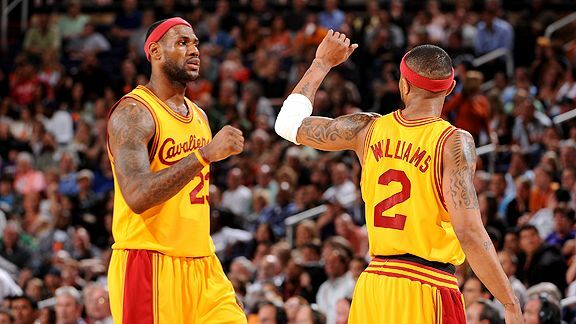 The Cleveland Cavaliers may have found LeBron’s sidekick… Mo Williams. Mo Williams, the high-scoring point guard from Milwaukee, will go to Cleveland in the deal, which should be announced later Wednesday. The 6-foot-1 Williams averaged 17.2 points and a team-high 6.3 assists for the Bucks last season. Cleveland will send shooting guard Damon Jones to Milwaukee and forward Joe Smith to Oklahoma City. Milwaukee also will get point guard Luke Ridnour and forward Adrian Griffin from Oklahoma City. Oklahoma City, formerly known as the Seattle SuperSonics, also gets Desmond Mason, the athletic small forward, from the Bucks. I know there are many Bucks fans celebrating this move. A lot of people don’t like Mo’s game since he’s not a pass-first point guard. But he was 16th in the league in assists (6.3), and he’s a terrific scorer (17.2 ppg) and a pretty good rebounder (3.5 rpg) for a point guard. He’s sort of a poor man’s Gilbert Arenas. He’s not a terribly good defender, but since leaving the Jazz a few years ago, he hasn’t been around a defensive-minded coach. If Mike Brown can get some defense out of him, he could turn Williams into an All-Star caliber player. I love this trade for the Cavs. And, as a Bucks fan, I hate this trade for Milwaukee. Luke Ridnour? Really? That’s the best you can do for a guy who averaged 17 points and six assists last season? Bucks GM John Hammond made some nice moves this offseason, but I don’t like this trade one bit.